He interweaves these “Sacred Maíz Narratives” with reflections on his acclaimed journalistic work on the topic of Red-Black-Brown Communities in Resistance to U.S. Law Enforcement and Military Violence as well as his latest collaborative project, Smiling Brown: Gente de Bronce – People the Color of the Earth, a book, play, and series of video dialogues which explore color consciousness and light-skin privilege. Roberto Rodriguez, PhD (Dr. Cintli) is an associate professor in the Mexican American Studies Department at the University of Arizona. He is a longtime-award-winning journalist/columnist who received his Ph.D. in Mass Communications in 2008 at the University of Wisconsin at Madison. He is the author of Justice: A Question of Race, a book that chronicles his two police brutality trials, and the co-producer, with Patrisia Gonzales, of Amoxtli San Ce Tojuan, a documentary on origins and migrations. 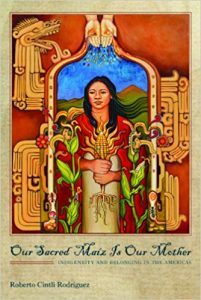 His Our Sacred Maíz is Our Mother (University of Arizona Press 2014) advances the thesis that Mexican/Central American peoples were not created in 1848 (war) or invasion (1519) but rather with the creation of Maíz some 7,000 years ago. In 2013, a major digitized collection was inaugurated by the University Arizona Libraries, based on a class he created: The History of Red-Brown Journalism. He currently writes for Truthout’s Public Intellectual Page and is a columnist for Diverse Issues in Higher Education. He recently completed a memoir/testimonio on the topic of political and law enforcement torture and other forms of violence: Yolqui: A warrior summoned from the spirit world. In 2013 he received the national “Baker-Clarke Human Rights Award” from the American Educational Research Association, for his work in defense of Ethnic Studies. This event has been made possible by a grant from the Tom and Carol Williams Fund and is generously cosponsored by the Clark Honors College, the Department of Romance Languages, the Department of Ethnic Studies, the Center for Latina/o/Latin American Studies, and the Food Studies Program.